But the Principle of Minimisation is getting overlooked as organisations struggle to cope with implementing other organisational and technical measures under the GDPR. Part of the problem is the legacy of the past 20 years. Organisations are great hoarders of data and love to create big ‘data lakes’ based on the idea that more data, once analysed, will unlock countless new revenue opportunities never dreamt of before. Yet the stark reality is that a feeble 13% of all UK companies feel they have mastered the knowledge in how to leverage the value of this stuff. But that hasn’t dampened their enthusiasm to hoard vast amounts of personal identifiable information. One of the fundamental rights of the Data Subject is Art.17, GDPR – the Right to Erasure (Right to be Forgotten). The right to have personal data deleted creates significant challenges for the Data Controller. 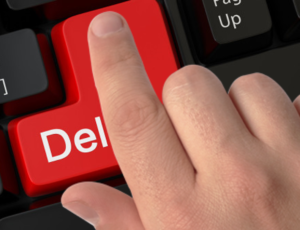 For example, ‘delete’ in cloud storage and in most database management implementation doesn’t actually mean delete. Rather it’s interpreted as ‘hide’. a purge capability of backups to ensure that deleted personal data isn’t restored in a database recovery situation. Conscious of their new legal responsibilities under the GDPR, Data Processors (cloud service providers) are beginning to offer real delete, but the default is to hide. Additional steps are required to achieve a real delete, argues Revill. At the heart of the issue is organisational culture that in most cases is pretty hard to change but must shift in order to create an environment of compliance with the new rights and freedoms of Data Subjects under the GDPR. This means both Data Controllers and Data Processors must re-boot their thinking about data protection and privacy. It’s about the Data Controller and the Data Processor learning to be the custodian of personal data and trusted to process it and this privilege can be withdrawn at will of the Data Subject in accordance with conditions set out in the GDPR. Amazon, Facebook, and Google will have their work cut out as they’ll have to change their business models and organisational culture in order to be compliant with the GDPR. Or suffer the consequences. The IoT adds a new dimension to this issue, if personal data is collated or cached at the edge. How is this going to be deleted? This must be addressed at the design stage but it also needs to be explicitly considered and addressed at an early stage of development. It can’t be an afterthought as it can’t be easily addressed later and will also infringe Art.25 Data Protection by Design and by Default, another part of the GDPR that’s important to factor into the workflow over the next 200 working days before the GDPR becomes fully enforceable across 28 EU Member States.